Japan's Keitaro Miyahara (10) is greeted by teammates after hitting a solo home run off Lufkin, Texas' Chip Buchanan in the fourth inning of the Little League World Series Championship baseball game in South Williamsport, Pa., Sunday, Aug. 27, 2017. 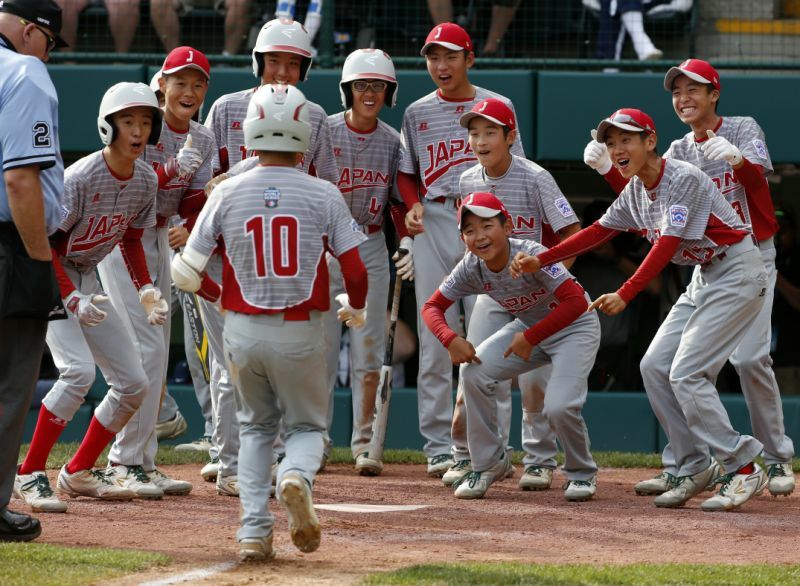 SOUTH WILLIAMSPORT, Pa. (AP) -- Tsubasa Tomii buckled down after allowing two first-inning home runs and Japan hit three homers in the fourth and won the Little League World Series title with a 12-2 victory over Lufkin, Texas, on Sunday. Keitaro Miyahara laced a two-run triple with two outs in the second to tie it at 2, and hit a solo shot in the fourth after fouling a ball off his foot earlier in the at-bat. Daisuke Hashimoto and Natsuki Yajima also homered in the fourth. Tomii cruised through the final four innings and finished with nine strikeouts. After starter Chip Buchanan was pulled in the fourth inning, Lufkin had trouble getting outs and the game was stopped in the fifth inning after Japan went ahead by 10 on Yajima's single to right field to score Seiya Arai. The title marks the 11th time a team from Japan has won the Little League World Series, five of which have come in the last eight years. Tokyo Kitasuna, the club representing Japan this season, has won three of the last six. Lufkin had a six-run comeback victory over Greenville, North Carolina, in the U.S. championship game Saturday to reach the final. And early on, it looked as though the team's momentum would carry through the championship. Japan had allowed only one run in the tournament heading into Sunday's game, but that changed when Chandler Spencer crushed the first pitch over the left-center field fence. Hunter Ditsworth cracked an opposite-field homer down the right-field line to put Lufkin up 2-0 with one out in the first. But after Miyahara's triple in the second, Ryusei Fujiwara fisted a single to right to bring Miyahara home and make the score 3-2. Japan added the final five runs in the fifth inning, which also was highlighted by Miyahara's two-run double. A REAL CHAMP: Champ Pederson, who was born with Down Syndrome, was enshrined as a member of the 2017 Little League Hall of Excellence class before the title game. He's the first player from Little League's Challenger Division to get the honor. The Challenger Division is for youth with physical and mental challenges. Pederson threw out an honorary first pitch alongside former major leaguer Mark Teixeira and spoke to the cMEXICO TAKES BRONZE: Mexico beat Greenville, North Carolina, 14-8 on Sunday in the third-place game. Twelve of 14 Reynoso hitters scored a run, and the teams combined for 14 runs in a 53-minute fourth inning. "I didn't think that we were going to make it this far," Greenville's Ashton Byars said. Byars hit his first home run of the tournament Sunday after promising his mom and dad he would knock one out of the park before the LLWS ended. Manager Brian Fields mixed in five pitchers who hadn't seen the mound all tournament. He said after the game he wanted all his players to experience the LLWS to its fullest. rowd before the game. He encouraged both Lufkin and Japan to work hard in everything they do and refuse to let adversity stop them from doing what they love. After the speech, Pederson sprinted out to center field and climbed the wall to touch the bust of Howard J. Lamade, for whom the stadium is named.